With loads of piano-centric features, the Yamaha YPG-235 is a portable grandmaster. It features GST keys, which are basically soft touch keys that take less effort to play and have the ability of adjusting the resistance to match the player’s style. For those with an obsessive need for more keys, there’s another edition of the YPG-235 that comes with 88 keys (YPG-535) but this particular version that we are reviewing came to us with 76 keys. Yamaha has always been an industry leader when it comes to musical instruments and it does maintain its track record with top notch sound quality on this Portable Grand piano. 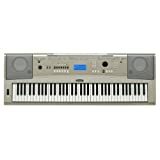 Alongside excellent sound quality, it comes with 30 pre-programmed songs and another 70 plus tracks on a bundled CD-ROM that works well to introduce newcomers to the world of digital pianos. Additionally, this piano will connect to a computer using a USB port and download even more songs from the internet. As for styles and voice, there’s plenty to choose from and be the lead for any musical composition. Some worth mentioning include tenor saxes, soprano, pan flute, trumpet, flute, rotor organ, organ and galaxy electric piano. Let’s begin with the construction and overall design, which is pretty striking and very Yamaha like. The big dual speakers on either side, the Yamaha logo imprinted on top of the keyboard section and the unique color immediately stand out at you. Then there’s the collection of buttons and control interfaces looping all over the top segment above the keyboard area without which this would never be a complete digital piano. Together though, we love the champagne gold glossy nature of this keyboard and its overall component arrangement. A word of caution for those who prefer light pianos, this one weighs in at around 8.3 kilograms or about 16 pounds so. The speakers are something worth mentioning again. The Yamaha YPG-325 benefits from Yamaha’s longstanding experience in building world class speakers. The dual arrangement both feature separate woofers and tweeters and this naturally shows in the sound quality produced. By the way, you also get a Bass Boost System that lets you pump in a little extra bass if the need arises. Compared to its elder sibling, the YPG-535, it does miss out on a few features such as 88 keys, a stand, sustain pedal and even a power adapter but, overall for the price this Yamaha beauty retails at, it is an excellent purchase. Let’s now move over the tones and notes. The keys themselves are sturdy and feel like they are made from heavy grade plastics. The touch is pleasant and the movement is smooth, not at all mechanical or simulated. If you aren’t aware, Yamaha actually grades all its pianos based on the keys they use. This one falls under the GST or Graded Soft Touch category. Other categories from Yamaha include the GHS, GHE, GH3 and NW. Not only are the keys different on all these series but also the overall manufacturing. Naturally, the more expensive a Yamaha piano is, the better its keys and manufacturing quality. The GST series does not mimic hammer effect of an actual keyboard but it does feature a responsive touch system. The Yamaha 235 Portable Grand piano excels with the tones it packs. It is accentuated by the AWM Stereo Sampling system that basically is an intelligent program running inside the piano in real time that selects the right sample depending on how the player responds to specific keys. Then there’s the Portable Grand Piano button (you simply cannot miss this button!) that immediately changes the sound signature to a conventional Piano setting without having to tweak with any of the settings or rhythm. As for sound options, you get nearly 500 additional settings plus proprietary Yamaha XGlite voices, nearly 361 signatures in total. In other words, finding the perfect combination of sound and voice should never be an issue on the YPG 235. If you happen to be a beginner or just started learning a piano, then the Yamaha YPG 235 is an excellent teacher thanks to the Y.E.S. version 6 bundled along with it. This is basically an education suite that teaches piano no matter what level you are at. Together with the 30 built in songs and the included CD-ROM anyone can move from a beginner status to a pro quick. And finally, the six track recording feature that lets you piece together several instruments on top of each other. For budding composers and music producers, this Yamaha digital piano is actually a complete studio suite in itself. Unfortunately, this particular model from Yamaha misses out on a MIDI connector so you cannot use it with studio applications and programs on a computer. The USB port is just so you can download songs off the internet to your piano. Superb sound reproduction as expected from Yamaha. XGlite voices together with the high powered speakers that have their own woofer and tweeter arrangement help produce magnificent music with absolute clarity and ample volume. Perfect for all difficulty levels. Beginners can learn along with the YAHAMA YES suite. Experienced pros can quickly cook up tracks and record them. Not too heavy, it weighs just 8.3 kilograms and with the compact width, it is perfect for a travelling musician. Amazing collection of preprogrammed songs for recreational activities and sing-alongs. Features all necessary connection ports for headphones, external speakers and computer input. Unfortunately, the YPG-235 does not pack a sustain pedal. The power adapter, sustain pedal and stand are all add-ons on the higher version, YPG-535. The keys are soft and easy to play on but definitely not close to hammer keys of a piano. The lack of a MIDI output connector is disturbing since this is nowadays a common offering. Total of 76 piano keys with Graded Soft Touch. Dual speaker arrangement with 12 Watt output and individual woofer/tweeter components. Yamaha Education Suite bundled with the piano helps learn the device quicker regardless of the player’s experience with a digital piano. Portable Grand button immediately reverts back settings to replicate a perfect stereo sampled piano. Total of 30 built in songs and included CD-ROM contains another 70 additional tracks. If the need arises more can be installed into the device by connecting to a computer using the USB-MIDI port. Total of 361 Yamaha exclusive XGlite voices. Several special voices such as Galaxy Electric Piano, Tenor Saxes, Flute, Trumpet, Rotor Organ and Organ. 6 Track recorder and sequencer allows for piecing together several instruments together for a complete studio performance. Superb connectivity, an excellent educational tool, splendid construction and a whole range of voices, sounds and additional media – is there anything that the Yamaha YPG 235 cannot accomplish? For beginners, this is an awesome Grand Piano to have. For professionals, it is exactly what a piano ought to be – capable in several areas and yet portable. Best of all though, is the price tag on this digital piano. At this price point, the YPG 235 Grand Piano is a no-brainer. Not the choice for you? Check out the rest of our digital piano reviews hub!